In those dark times the bombs fell on London from dusk till dawn. There were few real air raid shelters and most houses had only a basement or a cupboard under the stairs. Most Londoners, when the sirens sounded, headed for the underground stations where the platforms were transformed into dormitories, long rows of bunk beds being lowered into place every evening. There, at least, there was company.Our station was Clapham Common and my mother took me there each evening. The platforms were crowded with people and every new arrival would hunt out his own group of friends and neighbours before slowly settling down for yet another night. As the night drew on, anxious faces would look up towards the abandoned homes fifty yards above and about then, inevitably, someone would bring out a thermos of the universal British panacea; We would all have a nice cup of tea. "Merci pour ce que vous faites. Continuez comme vous avez commencé." 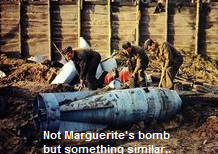 I have always wondered, my family has always wondered, who the unsung hero was, who sabotaged that bomb. Some brave Frenchman, doubtless a victim of the detested "STO", the Service de Travail Obligatoire, he risked his life and saved our home. Perhaps more important still, with his message, he helped others to find the courage he had himself, and which we all needed. Marguerite Bopp's family took refuge in London during the war when she was a young girl. On nights like she describes it must have seemed a little like leaving the frying pan for the fire!